Are you using a two-way radio every day in your work? Then a Brodit active holder will make your days much easier! By keeping your two-way radio in an active holder, you will always have it within easy sight and reach while driving between jobs Not only that; the holder also supplies a fully charged battery at all times. The cables are to be connected inside the dashboard, this gives a discreet, neat installation without cables hanging over the interior. The active holder has a unique slim design with the charging box integrated in the holder, so there is no large charging box on the cable. A LED indicator shows that charging is in progress, the indicator changes from red to green when fully charged. 12/24 Volt. The product is E-approved. Connect the power cable with a 2 A fuse. 2 A charger. Professional installation recommended. Attach onto ProClip Mounting Platform in your car. For ICOM IC-F1000 in all countries. For ICOM IC-F1000S in all countries. For ICOM IC-F1000T in all countries. For ICOM IC-F2000 in all countries. For ICOM IC-F2000S in all countries. For ICOM IC-F2000T in all countries. For ICOM IC-F29SR in all countries. 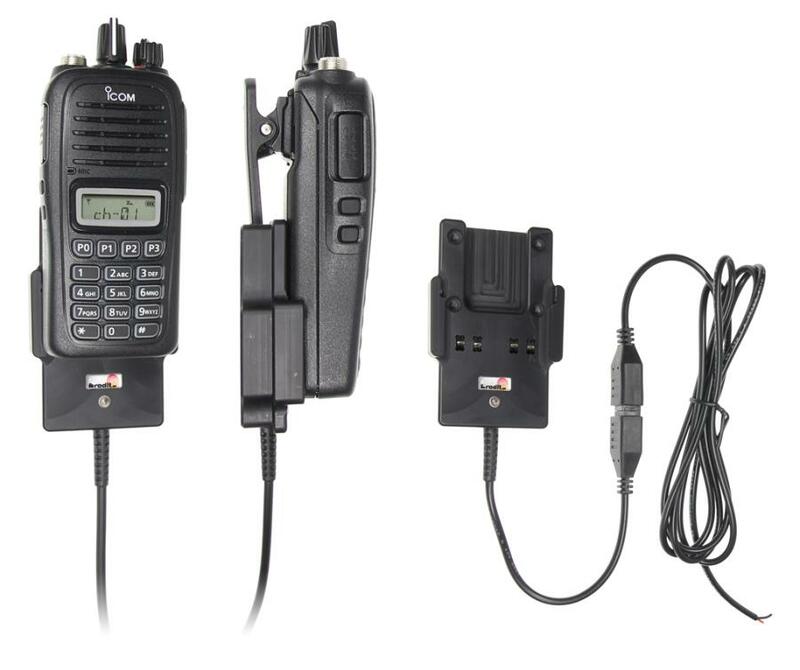 For ICOM IC-F3400D in all countries. For ICOM IC-F3400DS in all countries. For ICOM IC-F3400DT in all countries. For ICOM IC-F4400D in all countries. For ICOM IC-F4400DS in all countries. For ICOM IC-F4400DT in all countries.